Emerging economies are growing at such a pace, and with elevated resource requirements, that Russia's main export, energy, has witnessed exponential growth in prices. This has also given Russia a powerful impetus for development. Russia has more than 30pc of the world's proven reserves of natural gas (the largest share in the world) and substantial coal and oil reserves (10pc of the world's prospected reserves and 20pc of probable resources). It annually produces more than 12pc of the world's primary energy. It is being used as an energy donor, which is logical in view of its huge natural reserves, but this situation is still artificial because its economy is developing by selling energy reserves at underrated prices. Says Velikhov: "Russia must consider a way to move to a different kind of economy resting on a different technological foundation." Russia can remain a global energy donor only if spending on the reproduction of resources and development of new technologies is reflected in export prices. In this case, prices will depend on the rate of resource depletion and degradation of the resources' commercial quality. The current mantra of "exporting at any price" has meant that the country's complete economic policy is not yet fully developed. Russia has the world's fourth largest energy system (219GW) after the United States (more than 700GW), China (more than 600GW) and Japan (close to 300GW). But its rapid economic growth has nearly exhausted its energy reserves. Russia each year increases its output by about 1GW, while the US grows by 12GW and China by as much as 20GW. Russia, the largest energy supplier in the world, is short of energy in the domestic market. Velikhov also notes that Russia's foreign partners have changed their structure of energy consumption. Apart from direct consumption, industrialised countries are buying more primary conversion products by moving their companies (above all in the initial processing of resources) to developing countries. As a result, initial energy consumption in industrialised countries is growing much more slowly than their GDP. At the same time emerging economies which lack modern technologies and skilled personnel have to produce primary conversion products, thus ensuring the global division of labour to their own detriment. Velikhov cites figures to show that the volume of GDP that shifted from developing to industrialised countries amounts to as much as $10 trillion, or about 25pc of global GDP. The volume of shifted energy hidden in primary conversion products is comparable - 2.5bn tonnes of oil equivalent, according to most conservative estimates. This is only slightly less than the energy resources transported around the world (about 4bn tonnes of oil equivalent). Russia is one of the world's largest suppliers of aluminium, the production of which requires huge amounts of energy and therefore primary energy resources. Energy used to produce aluminium is regarded as Russia's internal consumption. Velikhov writes that the modern economy benefits countries located closer to the end product, which means that raw materials producers will be always worse off. In other words, Russia's decision to convert from commodities production to high technologies is not a fad, but a way to combat poverty. This change of strategy is certain to encounter powerful resistance from the commodities lobby both in Russia and outside, because it means that it will cut exports of rough timber, metal and energy-intensive chemicals and start exporting higher added value products. This will undermine the resource base of many of its foreign partners, who are processing Russia's primary goods and then selling them at a high profit. Russians are coming to see that their country needs to revise its policies to continue to develop and to simply live better. The economy of such a huge country as Russia cannot depend almost entirely on energy and mineral exports. The government must find points of contact for the current and future interests of states that cannot live without Russian resources: countries which are crucial to Russia in its tasks of reforming the economy. Nuclear development in Russia is covered under a government blueprint up to 2020. The plan envisions that overall domestic demand for electricity will increase 4pc per year, and calls for building at least four nuclear power plants in the Tver, Nizhny Novgorod, Chelyabinsk and Yaroslavl or Kostroma regions. Russia currently operates 10 nuclear power plants with a total capacity of 23.242GW. Under the basic scenario, output from the nuclear sector will double by 2020, and output from hydroelectric stations will increase by 60pc. At the same time, Russia will have to invest more than $282bn in the construction of power plants by 2015, and $204bn in 2016-2020. 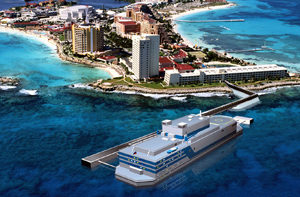 The plan also envisages the construction of unique floating nuclear power stations. The Sevmash shipyard in Severodvinsk in northern Russia has been building the first one for the past year. Due to be launched in 2010, it will also continue to operate in Severodvinsk. Several other floating power stations are due to be delivered to the Chukchee Peninsula and the Kamchatka Peninsula. Others may be sold to Indonesia, India and China. Floating nuclear power stations will be anchored in sheltered harbours by areas lacking access to joint power grids, and will transmit electricity to coastal plants. A floating power station costs about $200m, or less than a small ground power plant, and will recoup initial costs in just eight years.